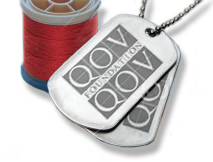 The mission of the Quilts of Valor Foundation is to cover all service members and veterans touched by war with comforting and healing Quilts of Valor”. In 2016, over 150,000 quilts were awarded. Quilts are made by 10,000+ volunteers across the country. InTheBend QoV is a group meeting the second Thursday and Saturday of the month at the church (9am-2pm) Both the group and the shop are recognized by QoVF as official groups who can accept donations to provide fabric and supplies for making the quilts. Check out our calendar for dates. First Presbyterian Church, Mishawaka, IN presented 11 quilts to members of the congregation who have served our country in the military in a special presentation during the Fellowship Hour on November 13, 2016. Copyright © First Presbyterian Church of Mishawaka. All Rights Reserved.